Hi, my name is Swatik Guha. CELTA happened to me when I was on the verge of getting lost in the corporate rat race. Being a corporate trainer for over 5 years had turned me into a thoroughbred corporate professional for whom meeting deadlines took precedence over developmental needs of trainees. As I lurched through the corporate maze chasing the next promotion, I often wondered and questioned the efficacy of the pedagogical methods used in corporate training. Some of the training techniques seemed too traditional, so I tried to innovate and introduce new ones. But with no formal training on teaching, I often found myself in at the deep end. At this time CELTA offered me a new glimmer of hope. A Cambridge certification in teaching English was reason enough for me to jump onto the course. I remember walking into the British Council on the first day beaming with confidence. Even though, I expected to gain a new perspective on teaching English I had underestimated the magnitude by half. The variety the course offered soon left all of us scrambling to cope with the stress. Our very able tutors, Steve and Charles, were always there to guide us and pick us up when we stumbled. The course was very well structured with observed teaching practice every day. I learned something new with every teaching practice and by the end of the course, I had the confidence to design my own lessons to teach English as a foreign language. The CELTA course has had an immense impact on my professional life. 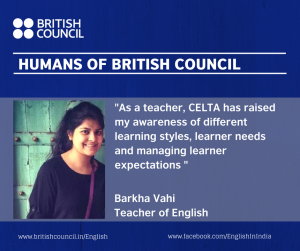 Soon after the course I applied for a job at British Council, New Delhi as a newly qualified teacher and within a year of completing the CELTA course I started working at the same center I did the course from. The CELTA course has opened many new doors for me. I have been teaching at the British Council for a year now and I have taught various age groups ranging from primary kids to adults. I have also taught a range of courses from general English to exam preparation course. The experience I gather at the British Council is rewarding as it helps me to become a better teacher every day. 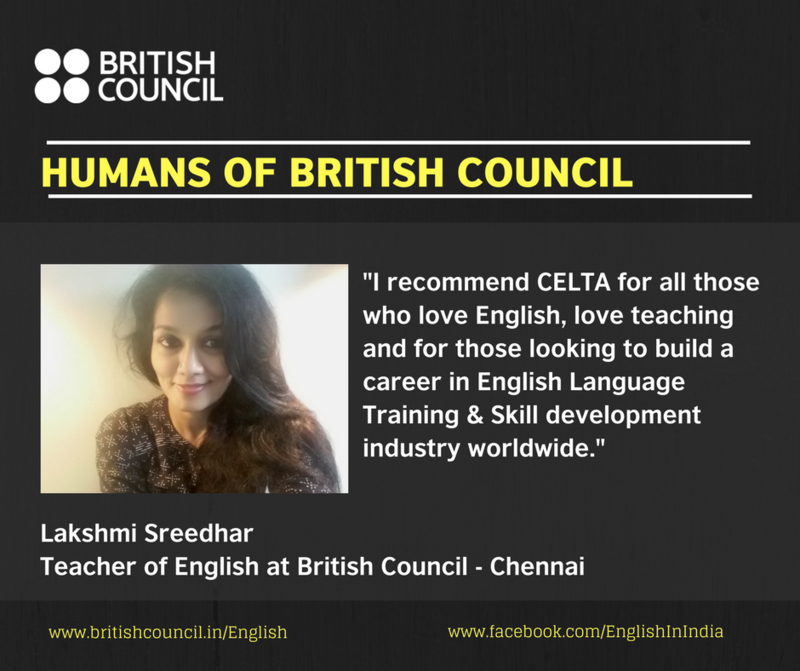 Hi, my name is Lakshmi Sreedhar and I am currently a Teacher of English at the British Council. 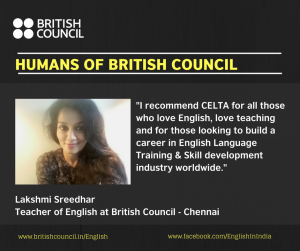 A Chartered Accountant by profession.I signed up for CELTA at British Council in June 2016, Chennai to pursue an alternate career in the world of English language learning and teaching. CELTA, a globally recognised certification, offered by the University of Cambridge, paved a way for meeting people from diverse cultures and backgrounds. It provided a challenging platform that enhanced my skill levels to a more holistic approach to teaching. The course included valuable inputs from experienced mentors on classroom management, engaging learners through activities, lesson planning and student evaluation along with real-time teaching sessions. I should say the course presented a completely new window into the language itself. CELTA taught me the techniques of effective teaching, an alternate approach to understanding English, along with practical methods for engaging learners. In particular, the structure of the course combined with an excellent library, offering wonderful resources and tools made learning intense, hands-on and fun. The program learning experience, as we cruised through the course, was enriching and tremendous because we were given the opportunity to try and implement the tips, techniques, and feedback followed by a guided evaluation of the results, leading to perceivable progress. The TP sessions and challenging assignments, I believe, has equipped me to further hone my skills as a complete teacher. A special mention needs to be made, about the wonderful team of CELTA program mentors I had, namely Robin, Usha, and Suganthi, who equipped me to navigate an intense and challenging course. The guidance and effective feedback provided helped in the successful completion of the course. The experience was invaluable as it taught me effective time management, kindled my creativity and improved my ability to plan and structure the class lessons. The CELTA badge opens up opportunities worldwide because of its recognition in the education and corporate sector globally. In my case, I got a full-time teaching position at the British council in November 2016. I recommend this course for all those who love English, love teaching and for those looking to build a career in English Language Training & Skill development industry worldwide. Hi, my name is Shalini Jain and I am currently a Teacher of English at the British Council. Having spent 12 years in the UK, most of them working in a typical 9-5 setting, I felt a change was long overdue. I imagined doing something more creative and rewarding in my professional life. After exploring a lot of options, I finalised on teaching English as a Foreign Language (EFL). I have always been a linguaphile and I felt that being an English Language Teacher would enable me to experience life in more than one language. When I went through the work prospects, it was apparent that if you are serious about EFL, then a formal qualification is a minimum requirement. On exploring all the available courses, I surmised that there couldn’t be a more reputable course in this field than CELTA. 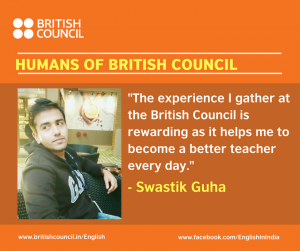 I decided to pursue this course through the British Council because it is a highly regarded organisation and I could connect with the values that the Council stands for. The CELTA experience is all about ‘Focus’. There was no luxury to be a procrastinator or a perfectionist! The four-week period was one of the most challenging and yet rewarding times for me. There wasn’t a lot of ‘learning’ involved, as much as ‘unlearning’- of notions, perceptions, and skills to deal with people. CELTA is all about ‘learning by doing’. We were teaching students from Day Two. It seemed daunting at first, but by the end of week one, we had started to learn the ropes of English Language Teaching (ELT). Our tutors – Steven, Vandana, and Robin were our lighthouses! They demonstrated excellent models of teaching. During our feedback sessions, they offered personalised constructive input which enabled us to improve our teaching skills significantly. There was a lot to be learnt from fellow CELTA trainees too. The class environment was rich because of people from different personal and professional backgrounds. It was not a competitive course at all, and everyone was supportive of each other. We bonded over colours, scissors and glue sticks like 5-year-olds! On most days you feel like an android- sleepless nights, long days, living on caffeine shots and sugar rush! Even so, I would recommend this course as the best way to get a solid footing in the fascinating world of ELT. 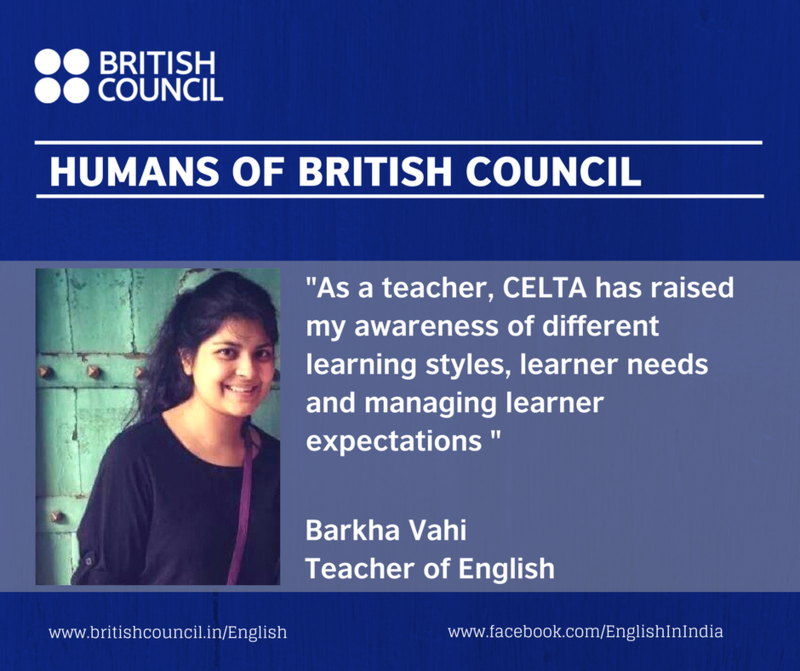 CELTA has enabled me to reskill myself as a teacher and create a more rewarding career path. It has helped me regain a sense of purpose and achievement both professionally and personally. When I interact with students of various nationalities, I gain an insight into different parts of the world. Through discussions with my colleagues, I unleash the power of collaborative working. By observing senior teachers and connecting with teachers across the globe, I draw inspiration to enhance my teaching skills. It is ultimately a dream job and I want to teach in as many countries as I can.